The Grip It Bag Clip is as functional as it is beautiful, a bag clip for almost any business branding opportunity. Grip It technology for superior holding power for documents as well as chip bags or large food bags. For an optional magnetic back to make into a promotional memo clip, add $.12 each unit. Each unit poly bagged then bulk packed in a carton standard packaging. Rush Bag Clips Production is available on selected clip colors. 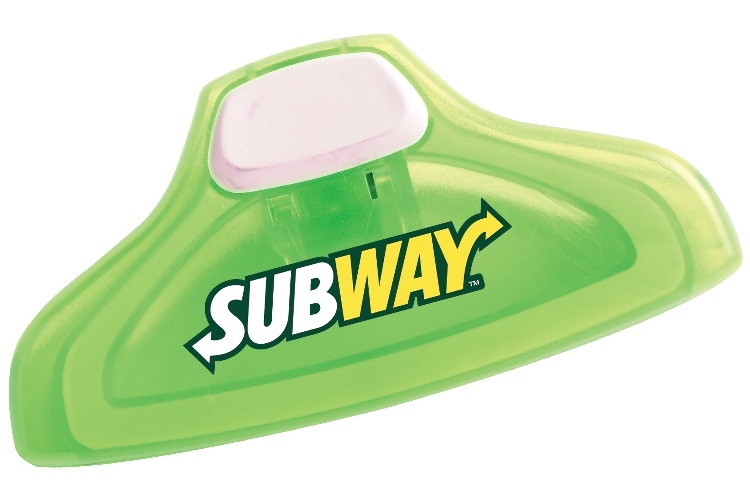 The overall size of the clip is 5" w x 2" h x 1 1/2" d.
This promotional item is Made in the USA. Price includes a one color imprint on one side in an area 3 3/4" w x 5/8" h.
$55.00 and a running charge of $.30 each unit. Bag clips have a max of a three color print.